MYSTIC, Ct. -- Connecticut Gov. 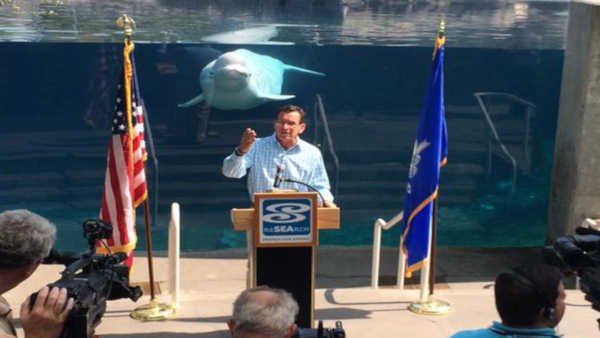 Dannel P. Malloy has found himself upstaged by a beluga whale during a tourism news conference at the Mystic Aquarium. Malloy was standing in front of the Alaskan Coast exhibit Wednesday touting an increase in summer tourism in Connecticut when a whale named Juno swam over to the glass to watch. The Democratic governor says attendance at nearly two-dozen venues surveyed by the state is up 5 percent over last year.